The retiring officers of the Grantsville High School FFA chapter show most of the incoming officers their positions during the closing banquet on May 11. 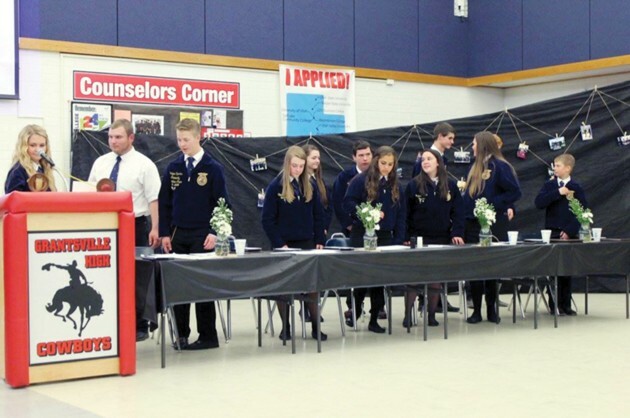 Grantsville FFA Chapter held its closing banquet on May 11, 2016. There were many awards given out and recognitions received during the banquet. Awards started from honorary greenhands to American degrees. Before the awards ceremony started, members and their parents enjoyed a nice steak dinner provided by Hunsaker Meats and entertainment from our own talented members. The 2016-17 officers were sworn in that night and the 2015-16 officers retired. Retiring from positions are chapter president Wyatt Harding, vice president Lindsey Johnson, secretary Olivia Gowans, reporter Hayley Evans, treasurer Esther Jordan, sentinel Jon Webb, committee chairman Bridger Sparks, student chairman Dakota Williams and chapter chairman Zachariah Haymore. We thank you for all your hard work and time put into making the 2015-16 year great! The 2016-17 officers are chapter president Lindsey Johnson, vice president Bridger Sparks, secretary Teri Dawn Haws, reporter Abigail Silva, historian Macady Haws, treasurer Olivia Gowans, sentinel Esther Jordan and executive committee chairman Tate Johnson.